Sarah Gerkensmeyer’s story collection, What You Are Now Enjoying, was selected by Stewart O’Nan as the winner of the 2012 Autumn House Press Fiction Prize, longlisted for the Frank O’Connor International Short Story Award, and chosen as the winner of Late Night Library’s Debut-litzer Prize. 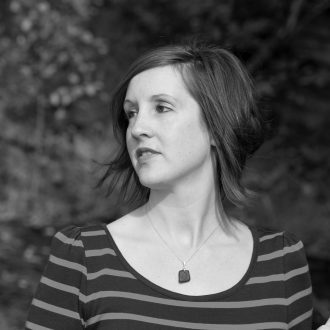 A Pushcart Prize nominee for both fiction and poetry and a finalist for the Katherine Anne Porter Prize in Short Fiction and the Italo Calvino Prize for Fabulist Fiction, Sarah has received scholarships to the Bread Loaf Writers’ Conference, Ragdale, Grub Street, SAFTA’s Firefly Farms, and the Vermont Studio Center. Her stories and poetry have appeared in American Short Fiction, Guernica, The New Guard, The Massachusetts Review, Hayden’s Ferry Review, B O D Y, Hobart, andCream City Review, among others. Her story “Ramona” was featured in a Huffington Post piece on flash fiction and also selected by Lily Hoang for the 2014 Best of the Net Anthology. Sarah was the 2012-13 Pen Parentis Fellow. She received her MFA in fiction from Cornell University and now lives and writes in her home state of Indiana, where she is a winner of the Indiana Authors Award.